CARIS collects information about any fetus or baby who has or is suspected of having a congenital anomaly and whose mother is normally resident in Wales at time of birth. It includes babies in whom anomalies are diagnosed at any time from conception to the end of the first year of life. Data collection commenced on 1 January 1998 and includes any baby where pregnancy ended after this date. 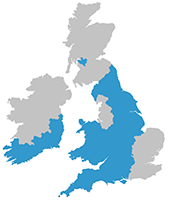 CARIS is a Full Member of EUROCAT and is referred to as Wales (UK) in the EUROCAT data. For more information about CARIS, click here.